Yesterday, Chris and I hit th Medina Ice Festival to check out the ice carving action. 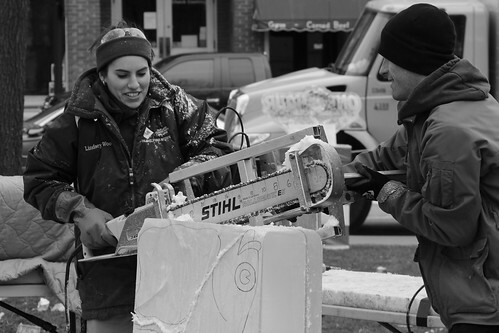 We got there way, way too early, so we spent a while walking around the Square getting pictures of the previous day's sculptures, but before too long the park was crowded with competitors and power tools, ready to turn 300-pound slabs of ice into beautiful works of art. As usual with photowalks, this one yielded many images that I would be proud to use for my 365. I really liked the mood in this one, though--two teammates who seem pretty happy to be manipulating a gigantic chainsaw together. And really, isn't that what life's all about?